I have been a posting FOOL lately, haven’t I? Well it’s because I’m off work and I adore my Foodies sooooo much! Ok, so as promised here’s my review of the Banana Nut Muffin Quest bars. After you watch it be sure to use the widget below to enter to win some for yourself! Remember, THREE of you will win some bars! Enter here to win some! I can not wait to try these ……..Love me some quest. These seem like they be a pcs of heaven. Love the review! !You make me smile and laugh while you "educate" me!! This review makes me want to try them. I actually like quest bars out of the package. Warming them up is a bonus. Peanutbutter Cup bars…how have I missed this???? The look so good, Do you know if they sell them in Canada? I like all of the flavors of Quest besides the brownie. For some reason that one is way too over powering for me. I'm excited to try the banana nut muffin flavor. Now I just have to find these! OMG….I think the banana nut muffin would be TERRIFIC! I am a HUGE fan of the quest bars since my surgery. They are one bar that I have NOT had any problems with. Thank you for this opportunity, but most of all thank you for your BLOG and help through my journey! I've never seen any of your video reviews, you're too cute! Love it! 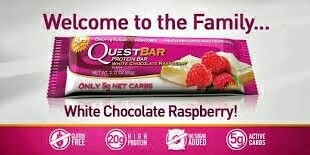 I love all Quest flavors and cannot WAIT to try the Banana Nut Muffin flavor! I love quest bars! Great a few months after surgery. Haven't tried them in awhile. Time to try the new flavors!!! Oh Nik, you crack me up 🙂 I will keep an eye out for these cause I would love to try them. In the mean time I have some overly ripe nanners waiting to be made into protein banana nut bread! I love QuestBars! My fave flavor is the Almond Vanilla one… (think thats the name) I want to try the Banana Nut one sooo bad!